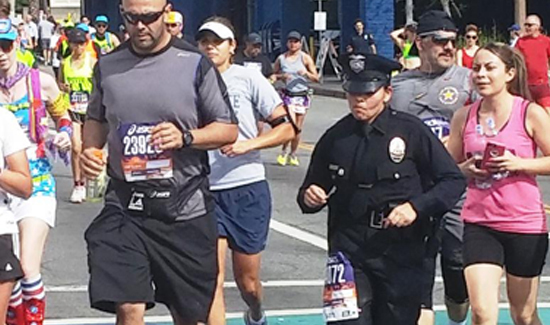 Kristina Tudor, officer with the LAPD, is running the LA Marathon in full uniform. 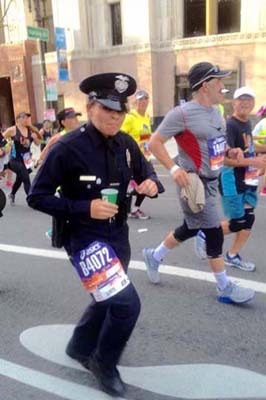 Kristina Tudor, an officer with the Los Angeles Police Department is running the LA Marathon today in full uniform to honor the fallen and raise funds for their families. According to KCAL Channel 9 News, Tudor said every stride she takes during the long, grueling race will represent perseverance through adversity, which is what families of LAPD officers injured or killed in the line of duty face daily. Tudor is no stranger to long-distance running and has competed in races above the standard marathon distance. “I really value being able to use my own two legs, my heart and a set of lungs and I thought, ‘Why not do it for the department?’ ” she said. Tudor says she trained hard for this marathon by wearing the additional 25 pounds she wears on duty. During the race she wore her boots, utility belt with gear, Kevlar vest, tie and hat. Great job Kristina! You’re determined as you have always been. But crazy in full uniform! Crazy good for a very worthy cause. All the best to all in blue and their families.